Don't let the classic styling and clean design of this Wrangler Riggs Men's Charcoal Grey 3W760 CH Short Sleeve Henley Shirt fool you. For well over 100 years, Wrangler has developed the magic combination of durability, fit, and comfort. As part of Wrangler's tough ... (see full details) (see specifications) #WRG3W760CH. Don't let the classic styling and clean design of this Wrangler Riggs Men's Charcoal Grey 3W760 CH Short Sleeve Henley Shirt fool you. For well over 100 years, Wrangler has developed the magic combination of durability, fit, and comfort. 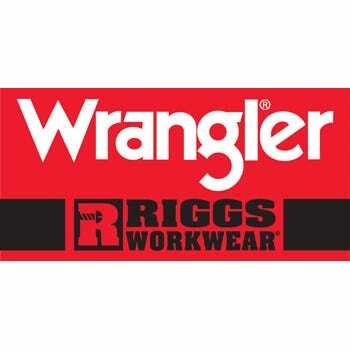 As part of Wrangler's tough and rugged Riggs Workwear collection, this grey design is made for grueling down and dirty work. This men's work shirt will be the one you turn to for everyday comfort and performance. It is crafted from 7-ounce 100% cotton ringspun jersey, offering both softness and strength, making it the ideal choice for any season. For added comfort, a tagless label eliminates stiff tags scratching your neck. Triple-needle stitching makes this shirt durable, and vented taped side seams add durability and comfort. The classic, short sleeve Henley design has a two-button placket and a large left chest pocket for carrying the everyday essentials. A hidden utility loop adds convenience. This versatile top look good tucked in or left hanging, giving you plenty of style options. This men's short-sleeve pullover delivers a comfortable, roomy fit, perfect for work where you need to bend, stretch, and twist. Offered here in popular charcoal grey, it's also available in other colors, offering plenty of versatility. C.C. Hudson worked hard to create a brand widely known for crafting exceptional long-lasting and comfortable clothes. His dream flourished and his business thrived because he knew that the quality of the clothes needed to surpass your expectations. Trust this Wrangler Riggs Men's Charcoal Grey 3W760 CH Short Sleeve Henley Shirt to provide you with a work tee made to last while delivering comfort and style. Order yours today from Working Person's Store, the home of brands that work! 143 out of 144 people found this product review helpful. I've had this Wrangler/Riggs Charcoal colored Henley Shirt for a couple of years and it still looks good after many washings. These Wrangler shirts are every bit as Nice as the Carhartt brand. They do tend to run a bit oversized, so you may want to order one size smaller than you normally do. Very high quality shirts that seem to last real well! 94 out of 94 people found this product review helpful. I have over 12 of the Henley style shirts of all colors. Very comfortable, stays soft and in shape after repeated washings. I work in the oil fields and would recommend this shirt to anyone looking for comfort and style. 87 out of 88 people found this product review helpful. This shirt did not get out of shape after washing and drying it. I like it. 79 out of 80 people found this product review helpful. Been wearing the same shirt for a month, like it enough to buy more. Washes up great. The Riggs is a great heavy duty Henley shirt, my only 2 exceptions are, it only has 2 buttons instead of 3 like most other Henley design shirts and the back around the shoulders feels a little tight when reaching for something. Otherwise its really well made and every bit as good as Carhartt. The Wrangler Riggs have more color selections available than Carhartt. Wrangler Riggs Shirts: Men's Charcoal Grey 3W760 CH Short Sleeve Henley Shirt is being added to your cart.